On Friday I went to see one of my favourite movies of all time, David Lynch’s Blue Velvet, at the Tate Modern’s Starr Auditorium. This is a great place to watch stuff. It fulfills all but one criterion of the Manifesto (the screen is a little small, although you won’t notice if you sit in the front few rows). 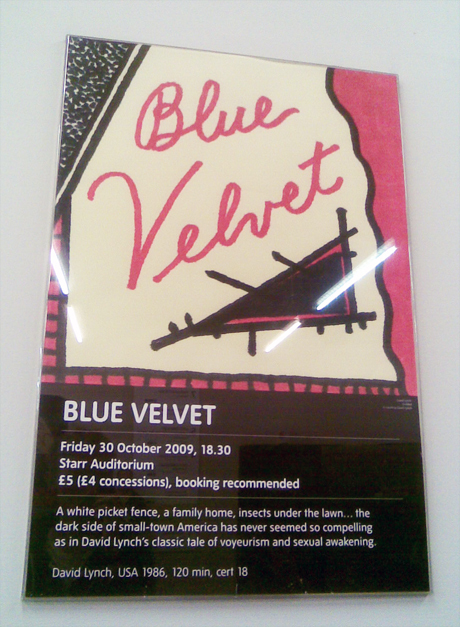 It uses it’s own posters like the one above, which are both arty (that’s an illustration by David Lynch himself at the top) and informative, and make you feel like you’re doing something amazingly cultural. Most screenings are one-offs so they’re packed out. Blue Velvet was an original 1980 print and looked tip top. They’re showing INLAND EMPIRE tonight so pop along if you can get a ticket.